The Essex Serpent has the distinction of being one of the most unusual novels I’ve ever come across, and I’ve been reading them for a long time. The critical reviews for it are stellar. The language is eloquent and frequently lyrical, reminiscent at times of Dickens, Austen, Hardy, and G. Eliot. The characters, though ordinary, are thrumming with life, and each represents a different aspect of English life in late Victorian times. Its narrative is an internal one, as it hops among their minds and their separate reactions to the same incident. Much of it is sad, yet it escapes being dismal. Into the mix, the author deftly inserts social and existential issues, which are just as relevant today as they were in the book’s own time frame. But the plot, that all important feature in any work of fiction, is skeletal. While I savored all the good things about The Essex Serpent, I kept wishing something would happen. When two momentous somethings finally did, they played out in such an understated fashion that their impact was all but blunted. The conclusion, though not surprising, left me wondering if the author was considering a sequel. If so, I’m not sure if I’d choose to read it. But I’m glad I read this one, if only to discover what influenced all the stellar reviews. 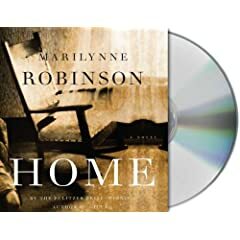 After listening to this audio book, and having read many eloquent and glowing reviews about Home, I can only conclude that I’ve missed something. A story of relationships – father/son, brother/sister, pastor/parishioner – Home tells of Jack Boughton’s attempt to come home again, to remake himself into the man his father wants him to be. Jack is clearly a very vulnerable, psychologically damaged individual, and after learning the details of his upbringing by a self-absorbed, preachy icon of a father, I can understand why. Glory is a good woman, but her own life has been barren, probably as a result of her upbringing as well. Two more guilt-ridden people would be hard to find. Both middle aged, and they are still afraid to reveal their true (“sinful”) selves to Poppa, or Sir, as Jack prefers to call him. This family drama, which is certainly a worthy subject, could do with less redundancy. The repetition of the words “I’m sorry”, “very kind”, and “Yes” alone contributes to some of the monotony. So my interpretation is not of one of family reconciliation, but of sheer survival, and of pathological emotional repression. I certainly glimpsed little of the unconditional love that is supposed to infuse this book. We must not disappoint Poppa. This version of Home was narrated by Maggi-Meg Reed, whose reading is rather expressionless and bland. From the Snapple website. Here’s a sample. #1 A Goldfish’s attention span is three seconds. #4 Slugs have four noses. #9 The average speed of a housefly is 4.5 mph. #11 Flamingos are pink because they eat shrimp. #16 The world’s termites outweigh the world’s humans 10 to 1. #17 A hummingbird weighs less then a penny. #25 The only food that does not spoil is honey. #26 The Hawaiian alphabet only has 12 letters. #50 Mosquitoes have 47 teeth. Who knew? These and more than 600 other factoids can be found at Snapple. A father who’s a top sports columnist. Wax teeth, the Butter Boys, infatuation with atomic energy, and a booming post-war economy. Is it any wonder that Bill Bryson (the second) turned out the way he did? Reading this crazy essay is a walk down memory lane for baby boomers. Who could forget crawling under a school desk to ward off the effects of a nuclear attack by communists? Or the rise of rock and roll? Bryson recalls and describes it all in his typical dry, wry, and deadpan way. I did not laugh my way all the way through it – that only happened maybe once in each chapter – but I never stopped smiling. Great fun.